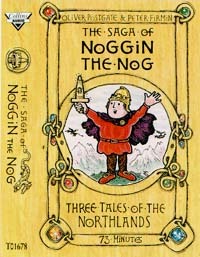 Although I seem to remember listening to the adventures of the People of the Northlands on audio cassette on many a long car journey years ago, I can't seem to find any details of these cassettes, with the exception of the fairly recent compilation "The Saga of Noggin the Nog". As details of what stories were available in audio format become available, they will be included in "The Tales". This three-story cassette containing "King of the Nogs", "The Ice Dragon" and "The Flying Machine" was published in 1992 and was still available up till very recently, so a few copies may still be around in book shops. The cassette was also released as a double cassette, backed with Ivor the Engine stories. This too has recently been deleted, but there may still be the odd copy about.